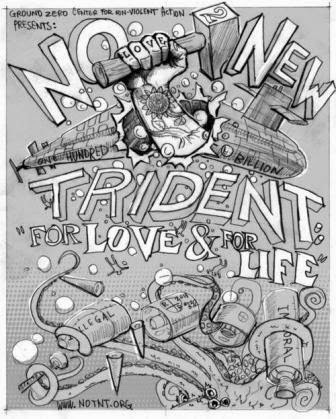 NO To NEW TRIDENT - For LOVE & For LIFE: Shoot First, Don't Ask Questions! Shoot First, Don't Ask Questions! Editor's Note: Here is a wonderful Earth Day perspective on nuclear weapons, with a focus on Trident, written by Linda Pentz Gunter. As Linda says, "Threatening to fire off nuclear missiles to deter a nuclear attack is about as psychopathic as you can get." What might be even more psychopathic is that Trident is not only a second-strike weapon system, but also (by its very design) a first-strike weapon system as well. Linda is the international specialist at Beyond Nuclear. "Beyond Nuclear aims to educate and activate the public about the connections between nuclear power and nuclear weapons and the need to abandon both to safeguard our future. Beyond Nuclear advocates for an energy future that is sustainable, benign and democratic. The Beyond Nuclear team works with diverse partners and allies to provide the public, government officials, and the media with the critical information necessary to move humanity toward a world beyond nuclear (from the Beyond Nuclear website)." Why do we humans resort to shooting, whenever a challenging problem confronts us? Whether it's culling badgers to protect hedgehogs, or renewing the Trident missile threat with expensive upgrades, our species seems determined to upset the balance of nature and harmony on Earth by shooting first - and never asking the questions at all. Threatening to fire off nuclear missiles to deter a nuclear attack is plain psychopathic. Shooting badgers to preserve hedgehogs is just poor science. But either way, if we really want to 'protect and survive', we need to stop all the shooting. I was recently reminded that hedgehogs climb trees. They do this, apparently, to take naps in presumably vacant birds' nests. Having been raised on a steady diet of hedgehogs as milkmen (Little Grey Rabbit) or laundresses (Mrs. Tiggy-Winkle,) this tidbit had escaped my memory. I found it when revisiting an old book from childhood: Oddities of Animal Life. Badgers, meanwhile, are early pioneers of OCD, so obsessive are they about hygiene. They change their bedding so often, piling the old material outside the set that, according to Oddities, "by the end of the summer, so much old bedding has been turned out that the pile outside the front door will have grown into a huge mound." But they also like to eat hedgehogs. So Fuzzypeg must be pitted against Brock. Badgers, those connoisseurs of cleanliness, have already been punished as the filthy purveyors of disease in cattle. With hedgehog numbers dwindling, the urchin gourmands must pay again with their lives. The solution to saving hedgehogs is to shoot badgers. None of this is particularly surprising. For while Nature seems to stay in balance quite nicely thank you - allowing badgers their fair share of hedgehogs to no ill effect - it is disrupted only when humans interfere. And the human answer, from time immemorial, to any problem you can't solve is to shoot it. In 1980, an article was published in The Guardian, written by Dr. John Gleisner, a founder of the Medical Campaign Against Nuclear Weapons. The headline read ominously: "When 'controlling' the sick will mean shooting them." Gleisner had attended a civil defence glee fest about the 'survivability' of nuclear war, held at Imperial College. There, Gleisner reported, the audience of medical professionals was told that the banned BBC film, The War Game, was "a nonsense which we should get out of our minds." But then things got sinister. There was, Gleisner wrote, an "underlying theme which stressed the need for pretraining in order to get 'hardened.'" Obviously there would be many sick and injured people after a nuclear attack whom the diminished numbers of medical personnel would not be able to treat. They would need to toughen up. "Home OffIce speakers made it clear that these people will be 'controlled,' and that training programmes in 'local control' are to be stepped up", Gleisner wrote. "They did not enlarge on 'control', but, like looters, it seems that they must be shot." Gleisner, a psychiatrist from Manchester, was well positioned to recognize madness when he saw it. And the Civil Defence program in Britain was most certainly mad, with the Home Office's infamous booklet, Protect and Survive, its ultimate insanity. Civil Defence briefings to county councillors included such insights as: "Animals which had died from radiation poisoning would be edible if they were bled first." For desperate survivors of a nuclear holocaust, this presumably would have included badgers and hedgehogs. Cruise Missiles were even madder, taking the concept of shooting' to its ultimate obscenity. It was Gleisner again, along with his wife who, in 1980, mortgaged their house to fund the booking of a train from Manchester to London to bring people to the first big demonstration against Cruise missiles. 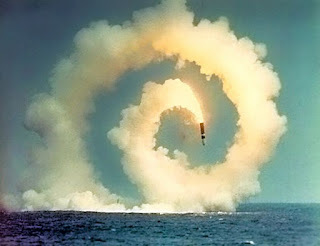 Shooting off Cruise Missiles naturally led to more shooting - the shooting down of nuclear missiles. Or at least the belief that we could shoot down - or intercept - nuclear weapons headed our way. This nuclear ping pong was made popular by US President Reagan and his silly Star Wars program, more properly known as the Strategic Defense Initiative. It still goes on today, largely between US based submarines and Kwajalein Atoll in the Marshall Islands, the site of 67 US atomic tests during the Cold War. Which brings us to Trident. As recently as last November, the US fired two consecutive unarmed Trident II (D5) missiles at Kwajalein. A military spokesperson told the LA Times that Trident II "is a centerpiece of the US military's ability to deter a nuclear attack, and an ongoing effort to modernize the weapon is a top priority." 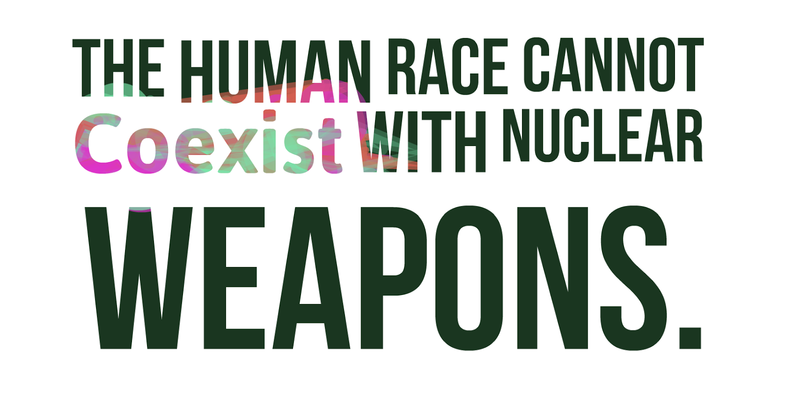 And yet just this month, we have President Obama, at the Nuclear Security Summit in Washington, DC, restating his conviction that "the entire premise of American foreign policy as it relates to nuclear weapons for the last 70 years has been focused on preventing the proliferation of nuclear weapons." Except, perhaps, in the United States. The US Navy is planning to replace its Ohio-class ballistic missile submarines, and is seeking $773.1 million in advance procurement funding and $1,091.1 million in research and development funding for that purpose. This would pay for 14 new submarines, each of which would carry 24 Trident II missiles, according to a report prepared for Congress by the Congressional Research Service. Each of those Trident missiles would in turn carry eight warheads with yields as high as 36 Hiroshima bombs. The US Navy considers these nuclear-powered ballistic missile submarines to represent "a survivable system for carrying out a retaliatory nuclear attack", the CRS report noted. And so the insanity continues: this idea that we can fight, win and survive a nuclear war. As Gleisner wrote, in such an environment, "'survival of the fittest' becomes 'survival of the most psychopathic.'" Threatening to fire off nuclear missiles to deter a nuclear attack is about as psychopathic as you can get. Shooting badgers to preserve hedgehogs is just poor science. But either way, if we really want to 'protect and survive', we need to stop all the shooting. Only then, when we agree there is room for us all, can we start to restore true balance and harmony on Planet Earth.